Although Nerja is a small place and maybe a little far flung from the famous tourist towns of Torremolinos, Fuengirola and of course Marbella, it’s a town that’s currently bucking the provincial trend in terms of tourism statistics. This past Easter period saw Nerja hotels reach more than an 85% occupancy rate despite the uncertain weather over the period, keeping the municipality above the provincial average. Despite the fact that national tourism statistics are noticeably down in Spain the majority of visits continued to be by Spanish nationals with many residents of Madrid making the journey to the coast and Nerja. International tourists have been making up the shortfall in visitor numbers in Andalusia in recent times and this was also echoed in the numbers released with the British and Germans coming next in terms of numbers. With Nerja’s popularity as a holiday destination continuing to rise I thought it would be a good idea to highlight what’s going on in the town in the coming weeks for anybody already planning their visit or any readers who might fancy a quick getaway. Each year Nerja takes a day to celebrate the numerous foreign cultures and activities within the town with the “Residents Day” fair. Foreign clubs, associations and local businesses come together in Plaza de España just a short walk from the Balcón de Europa to showcase their contribution to the town and the region as a whole. This can take many forms but always includes music, dancing and food from all over the world. This year has broken previous records with thirty nine stalls expected, two more than the previous maximum, and a varied number of groups taking part including Casa Argentina, the Nerja Donkey Sanctuary, Casa Ecuador and Coastline FM. Activities start from midday and go on until 7pm. 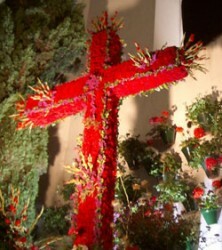 Day of the Cross or May Crosses as they’re also known, is a tradition that’s popular across Andalucía with Nerja being no exception. During the first few days of May the towns religious brotherhoods, social groups and even individual neighbourhoods build and decorate crosses, which can be two to three meters tall. The crosses are decorated primarily with flowers and palms although you’ll find all manner of imaginative decorations which often end up forming quite an elaborate display, consisting of far more than a simple decorated cross. As ever, temporary bars pop up with proceeds often going to the funding of religious processions and events, drawing in both locals and visitors and frequently leading to impromptu music and flamenco dancing. Nerja is a great place to experience Dia de la Cruz with the charming narrow streets and white washed old town offering a more intimate experience than that to be had with the larger displays in Cordoba or Granada. Isidore the labourer, patron saint of farmers and labourers, is a figure celebrated all over the world for his compassion to animals and the poor. Although not every Spanish town celebrates him Madrid, for whom he acts as patron saint and many agricultural communities do, setting aside the 15th May each year to hold events in his honour. 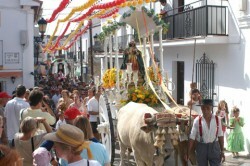 In Nerja this takes the form of a procession from the towns centre to the Nerja Caves where the celebrations continue throughout the night. 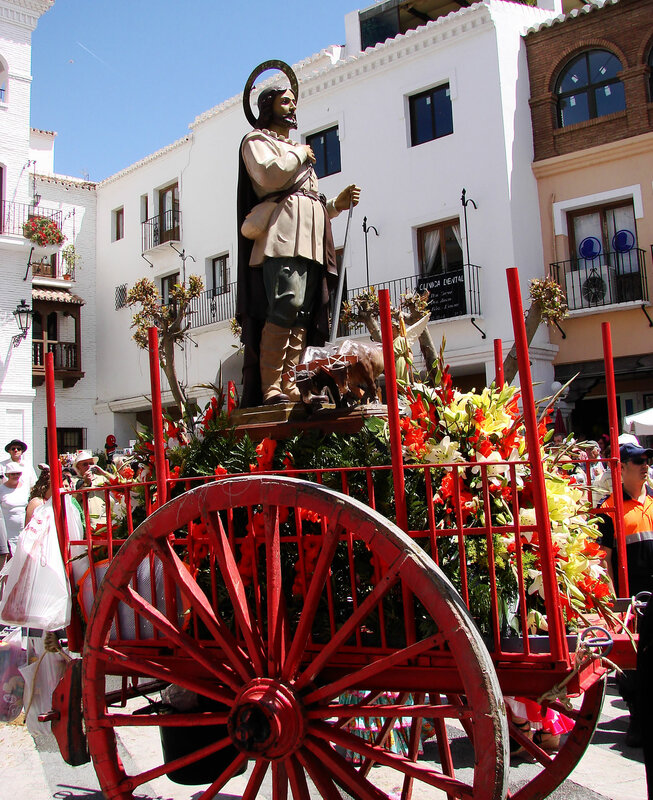 Officially the day is all about giving thanks to San Isidro and asking for good fortune in the coming year but it gives visitors a great opportunity to see many of the sights and sounds we commonly associate with Andalusia and Spain in a truly authentic setting. Also known as La Nuit Blanche, La Noche en Blanco is a cultural initiative started in Paris in 2002 which has spread throughout the world over the past eleven years. Its purpose is to bring contemporary art and creativity to a wider audience by turning cities and towns into one large performance space for an evening. It’s a project that Nerja took part in last year and is repeating this year with many local performers already signed up. There will be musical and dance performances all over the town with cultural installations such as the museum, culture centre and exhibition halls open to visitors. The main performances are set to take place on the Balcón de Europa and Plaza de España.